I’ll be presenting some workshops for writers and aspiring writers at Write on the River, May 13-15! It’s at Wenatchee Valley College in Wenatchee, WA, in in North Central Washington. If you live in that area and want to attend, you should register here ASAP! Making a good living as an author is not just the luck of the draw, and it’s not (unfortunately) just about having great books. Knowing how to get your book in front of readers and entice them to buy it are now more important than ever before. Join Shoshanna Evers for a step-by-step game plan that will set you on the path to being an indie author superstar! How to begin your internet presence with a simple, DIY author website, Facebook page and profile, as well as Twitter and Goodreads. How to pick keywords and BISAC categories for your novel to increase your book’s discoverability. The importance of picking a sub-genre and sticking with it until your audience is established, and/or writing a series. How to avoid being marked as an amateur, especially when soliciting reviews or using social media. Pros/cons of publishing exclusively with Amazon through KDP Select. What your book’s backmatter must include to get readers to leave a review, sign up for your mailing list, and buy your next book! How to (and why you need to) start a mailing list of your readers immediately. See more at the conference website here. The Crucial Mailing List. How to start and build an opt-in email list of readers who want your next book (and what to email them!). Discussion and Q & A. 5 Top Promo Tools for Indie Authors. Free or inexpensive ways to promote and market your indie book. Discussion and Q & A. Other awesome authors presenting include: Rebecca Zanetti and Trish McCallan from my local Romance Writers of America chapter (IECRWA), Dan Gemeinhart, Derek Sheffield, Jason Brick, Elizabeth Fountain, Matthew Sullivan, me (Shoshanna Evers Gabriel), Bill Johnson, Bonnie Rough, Django Wexler, and Robert Dugoni. Literary Agent Rachel Letofsky will also be presenting. ← Podcast Interview on The Write Stuff! Thank you PLUS EXCERPT! 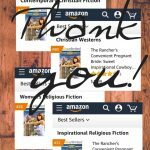 Contemporary Christian Fiction bestseller on Amazon! Were you 1 of 100 winners given the WRONG BOOK???? 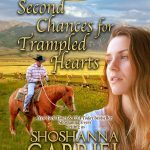 Goodreads Giveaway MIX-UP!! CONTEST! 100 Readers Will Win “The Rancher’s Convenient Pregnant Bride”! HUGE 100 ebook giveaway for Bear Creek Saddle Cowboy!